To celebrate Seattle Seahawks won the New Orleans Saints, Ihop is offering One FREE short stack of buttermilk pancakes from now through this Friday, January 14th! 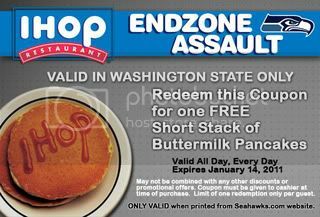 Just go to the Seattle Seahawks website and print out the coupon and get your free pancakes! One per guest. Washington Residents only. Tomorrow, October 31st only, kids ages 12 & under can get a FREE Scary Face Pancake at participating IHOP locations between 7AM and 10PM (limit one per child; dine in only). Tomorrow, March 7th, IHOP to celebrate National Pancake Day! Participating restaurants will be offering a FREE Short Stack of Buttermilk Pancakes from 7AM-7PM valid for dine-in only! Tuesday, July 18th from 7AM-7PM! On this day, participating IHOP restaurants will be offering up a Short Stack of Buttermilk Pancakes for ONLY 59¢ to celebrate IHOP’s 59th anniversary – NO coupon needed! Note that this offer is valid for dine-in only and there is a limit of one per person. Through February 12th, participating IHOP restaurants are offering up All You Can Eat Buttermilk Pancakes for just $3.99 valid for dine-in only. Please note that price and participation may vary.